Again we have a film that doesn't technically qualify as a kaiju picture, but in a cinema landscape where men in rubber suits have become almost obsolete, The Host - not the YA Saoirse Ronan vehicle from this year, but Bong Joon-ho's 2006 creature feature - stands out as one of the very best monster movies to be released in the new millennium. If that sounds like a shaky claim, here's a shakier one: The Host may well be the modern heir apparent to Godzilla. The basic set-up may sound familiar; reckless pollution in the name of science leads to the birth of an aquatic beast that rises from the watery depths and starts wreaking havoc on the mainland. It's the details that give The Host its distinction, with all of the political subtext brought directly to the surface and every shred of humanity invested in one family just trying to survive the resultant mayhem. 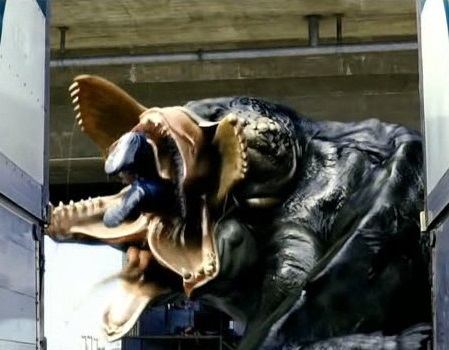 Despite being smaller in scale, The Host faithfully follows the classic kaiju template to a "T."